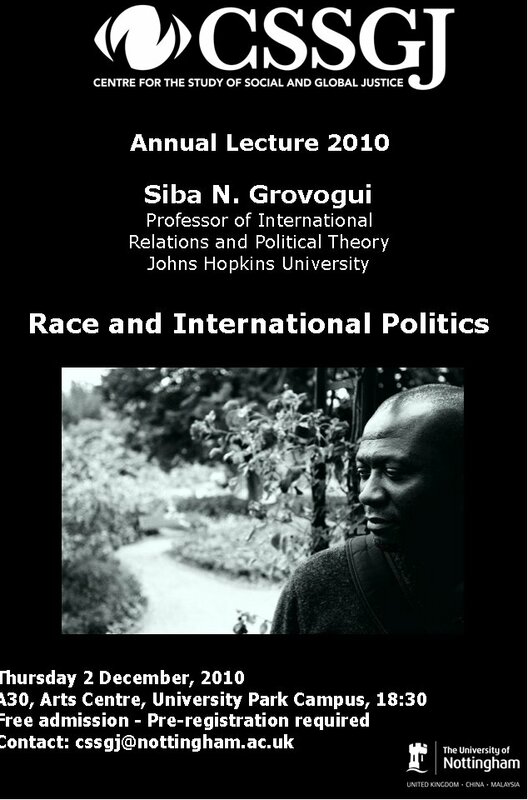 The Centre for the Study of Social and Global Justice would like to invite you to its annual lecture tomorrow given by Professor Siba Grovogui on Race and International Politics. Dr. Siba Grovogui, professor of Political Science at Johns Hopkins University, was born in Guinea in the northwestern region of Africa. At the incredibly young age of 27 he became a senior judge sitting on the second court of appeals in Guinea. He relocated to the US in the late 1980s. First, as a doctorial student at the Wisconsin University in Madison, and later in 1995, as an Assistant Professor and then Professor at the Johns Hopkins University. Siba Grovogui’s published works include Sovereign, Quasi-Sovereigns and Africans (1996) and Beyond Eurocentrism and Anarchy (2006). These books have made landmark contributions to International Relations, International Law and Postcolonial Studies. Among Siba Grovogui’s current projects is a third book Otherwise Human: The Institutes and Institutions of Human Rights on human rights and the Haitian revolution. He explains how this book is a response to ‘liberal (and) cosmopolitan views of human rights and the processes of their implementation as international norms’. ‘Contrasting the American and French norms with those emanating from the Haitian revolution, one arrives at different arguments on the conditions of ‘enslavement’ (literal and metaphorical) and therefore of freedom. Specifically, the analyses of the human rights regimes propounded by the participants of these events underscore the fallacy of contemporary theoretical categorization of human rights norms into first, second, and third generations. These domains of rights appear conjointly and contemporaneously in Western practices including in Haiti. These respective domains and their precepts introduced equally enforceable notions of ethics. While American and French revolutionaries sought to rectify the political context of the degradation of social life, former slaves in Haiti rightly identified economic, social, and cultural systems as the historical threat to human dignity’.